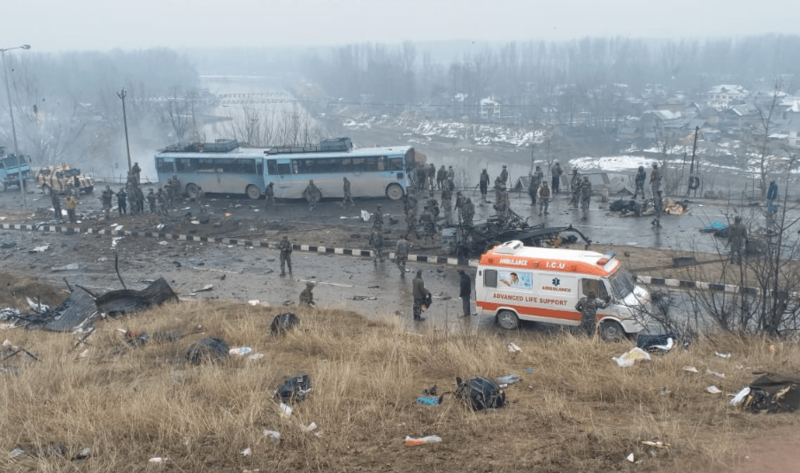 SrinagarI: Politicians from across parties expressed shock at the militant attack on a Central Reserve Police Force (CRPF) convoy in Jammu and Kashmir’s Pulwama today in which at least 26 CRPF personnel were killed and over 40 injured. Many of the injured are said to be in a critical condition, and have been taken to the army hospital in Srinagar. Militant group Jaish-e-Mohammed has claimed responsibility for the attack in Pulwama’s Awantipora. Congress president Rahul Gandhi called it a “cowardly attack”. “I’m deeply disturbed by the cowardly attack on a #CRPF convoy in J&K in which 10 of our brave men have been martyred and many others wounded. My condolences to the families of our martyrs. I pray for the speedy recovery of the injured,” he wrote in a tweet. Home ministry sources, according to NDTV, said that militants triggered the car bomb while the convoy of over 70 CRPF vehicles was plying through the Srinagar-Jammu Highway in Goripora area. One of the vehicles bore the brunt of the explosion. The stretch on which the incident occurred was largely believed to be sanitised of militant activities, and the authorities have termed it as a “serious breach” of security. Jammu and Kashmir politicians Mehbooba Mufti and Omar Abdullah were among the first to condemn the attack. “No words are enough to condemn the gruesome terror attack. How many more lives will be snuffed out before this madness ends?” People’s Democratic Party chief and former chief minister Mehbooba Mufti tweeted. “I condemn this attack in the strongest possible terms. My prayers for the injured & condolences to the families of the bereaved,” National Conference leader and former chief minister Omar Abdullah tweeted. West Bengal Chief Minister Mamata Banerjee expressed her condolences to the families of the CRPF soliders who were killed. “Saddened that 13 CRPF jawans became martyrs today in Pulwama. We salute our brave jawans and extend our solidarity and condolences to their families. Our prayers for those injured. We wish them a speedy recovery,” she tweeted.